Prospect research can seem daunting and overwhelming. There are a ton of resources out there, but there is not a lot of guidance. Maybe you’re ready to get started with prospect screening, or maybe you’ve been in the game for a while and you’re curious about any tools you might have missed. Either way, this list will help. 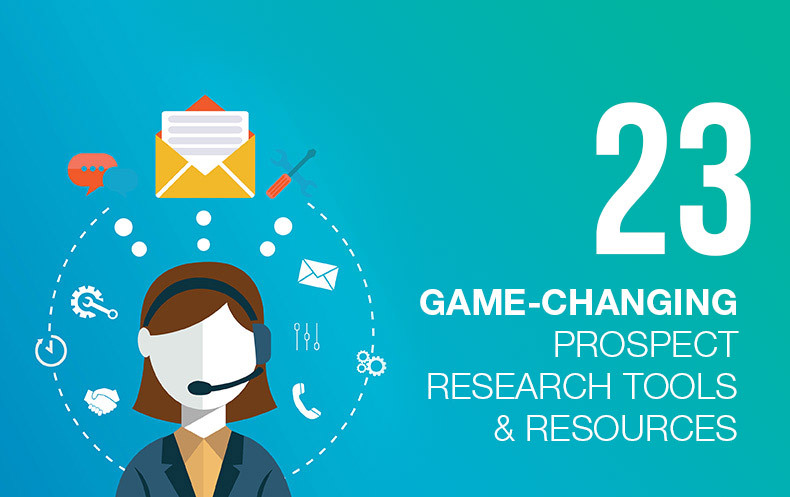 Below you’ll find a compilation of 23, yes, 23, game-changing prospect research tools and resources. For your convenience, we’ve divided all 23 prospect research tools and resources into categories of three. These 23 suggestions will help fill and organize your prospect research tool belt. Click on any of the links below to jump to a particular category on the tools and resources list. Category A: DonorSearch Resources 1. DonorSearch’s Blog 2. DS Giving Search 3. DonorSearch’s Charitable Giving Database 4. DonorSearch Consulting Partners 5. Double the Donation Integration Category B: Philanthropic Records 6. Your Library 7. Foundation Center 7. GuideStar Category C: Government Related 9. FEC.gov 10. SEC.gov 11. County Tax Assessor’s Site Category D: Professional and Biographical Research 12. Marquis Who’s Who 13. D&B Business and Executive Information 14. ZoomInfo Category E: Real Estate Holdings 15. LexisNexis Real Estate Records 16. Zillow 17. Trulia Category F: Interactive Sites 18. National Center for Charitable Statistics 19. The Million Dollar List 20. How America Gives — The Chronicle of Philanthropy Category G: Social Connections 21. Google 22. LinkedIn 23. Facebook Some of these prospect research tools are free and others require a subscription or purchase. Use this list as a launching point to help find which prospect research resources suit the needs of your nonprofit and which don’t. As a prospect screening company, DonorSearch offers a wide selection of prospect research resources in addition to its screening tools and services. Let me just move this giant elephant out of the room and address the obvious; the very blog you’re on right now is a great source of prospect research information, if I do say so myself. And I do. All joking and partisanship aside, this blog provides comprehensive content on all things prospect research. From the more general, like our Ultimate Guide to Prospect Research, to the very specific, 5 Best Practices for Grateful Patient Programs, we strive to address all of your prospect research questions. We also invite industry leaders to guest blog from time to time to share other perspectives. Click here to check out the DonorSearch blog! Currently in its beta version, the DS Giving Search is a free prospect research tool designed primarily for mobile devices. The tool provides a condensed version of DonorSearch’s philanthropic donor data; essentially, users see a snapshot of a donor’s charity and capacity. This tool is free for everyone, whether you’re a DonorSearch client or not! Click here to check out DS Giving Search! DonorSearch’s charitable giving database is one of the fastest growing and largest philanthropic databases in the country. The database is filled with a combination of print and online resources that you won’t easily find elsewhere. Leverage the database to complete your donor profiles with the data your team needs to successfully cultivate, acquire, and retain donors. One of the most valuable resources DonorSearch has to offer is our network of consulting partners! Serving a wide range of nonprofit clients from all corners of the nonprofit sector, we are fully confident you can find someone to fit your needs. If you’re thinking of taking on some expert guidance, be sure to study up on some prospect researcher hiring considerations first. For example, if you’re a smaller nonprofit without an in-house donor research team, you can turn to our partner Donorly! The Donorly team, led by Sandra Davis, specializes in helping smaller nonprofits achieve ambitious fundraising goals based on valuable donor research. And they use DonorSearch’s database! Ever wonder who among of your donors would make a great prospect for a matching gift request? DonorSearch’s platform integrates with Double the Donation, the leading matching gifts database software. When evaluating your prospects, Double the Donation will indicate which of your supporters works for a company that offers matching gifts. This way, your team will always know who to get in touch with, how their employer’s matching gift process works, and other key details that can help boost your fundraising strategy. Try out a demo of DonorSearch’s prospect research tool today! When investigating new donor prospects, it’s important to look at their philanthropic data. The prospect research tools listed below will help you uncover valuable details about a donor’s philanthropic history. This is a bit of a throwback resource, but people often overlook their local libraries, mostly because their popularity has waned. Libraries can give researchers free access to a wealth of information on philanthropy just with the swipe of a library card. Especially if you’re on a tight budget, they’re a great option. Check out all the biographical, business, and newspaper databases your library has available. Many of them are specialized resources that are very expensive to purchase or use online. Your library will probably have access to online resources that, again, would be prohibitively expensive to purchase on your own. Click here to learn more about using the library! If you’re lucky enough to live near to one of those cities, check out what the Foundation Center has to offer in person. Click here to check out the Foundation Center! GuideStar gives you a true window into the nonprofits you research. Click here to check out GuideStar! Between FEC.gov, SEC.gov, and county tax assessor’s public records, you’ll be able to discover tons of predictive donor data using government related prospect research tools and resources. The FEC provides comprehensive data on contributions to political campaigns. Simply input a prospect’s name and any other identifying details you have for that person, such as zip code, place of business, etc. If the prospect has contributed to a political committee or campaign, you’ll be able to see how much they gave and whom or what they gave it to. Click here to check out FEC.gov! The U.S. Securities and Exchange Commission keeps a free, searchable database, EDGAR, which has corporate filings. The search tool is fairly extensive. It lets users perform a four-years-full-text search when in advanced mode. Click here to check out SEC.gov! The real estate records you uncover can be incredibly valuable in that they both help predict future giving and can be used to determine donor giving capacity. Click here to search through county tax assessors’ sites! A major component of prospect research is discovering the business affiliations of your prospects. And the databases of professional and biographical information listed here will help you do just that! Marquis Who’s Who has an online database with a comprehensive population of biographies on top leaders in the fields of business, law, science, the arts, government, medicine, and entertainment. It’s a powerful tool that can give your fundraisers a well-rounded understanding of the individuals they’re soliciting donations from. Click here to check out Marquis Who’s Who! Dun & Bradstreet’s collection of 14,000,000 records is one the largest collections of details on privately-held businesses and their executives. Click here to check out D&B Business and Executive Information! ZoomInfo’s database contains detailed profiles of 7 million businesses and 95 million business people. When having a hard time finding contact info for a prospect, type her name into the ZoomInfo search bar and you’ll likely be provided with the prospect’s email, phone number, and company details. Likewise, if you’re looking for certain details on a business, the same process applies. Click here to check out ZoomInfo! Since significant real estate holdings are such a critical indicator of future giving, it’s crucial that your nonprofit knows the best prospect research tools to help you study up on property records. LexisNexis Real Estate Property Records is one of the most robust compilations of real estate and property records in the country with information on more than 120,000,000 properties throughout the United States. With information ranging from county tax assessments to detailed sale information on a property, it can be an immensely valuable resource in your search for your prospects’ and donors’ real estate data. Click here to check out LexisNexis Real Estate Records! Real estate ownership is both a wealth and a philanthropic marker. Donors that own $2+ million in real estate are 17 times more likely to give than the average prospect. Once you have a prospect’s address, you can enter it into Zillow and find an estimated worth of the property. That’s valuable information for your development staff to know. Click here to check out Zillow! Like Zillow, Trulia allows you to search for property estimates and purchase prices by using your donor’s address. Click here to check out Trulia! Outside the scope of traditional wealth and philanthropic databases, there is a selection of other top resources that can give further insight into a prospect’s philanthropic tendencies and behavior. This site features a free, easy-to-use search bar that lets you look up details, like 990 filings, on most nonprofit organizations. Click here to search through the National Center for Charitable Statistics! The database is ideal for searching for the cream of the major gift crop. The Million Dollar List database includes listings of publicly announced charitable donations of $1 million or more since 2000 in the United States. Looking for an organization altering donor? He’s probably on that list. Click here to search through the Million Dollar List! This interactive tool allows users to investigate charitable giving by geographic location. It was created in 2012, so the data is a bit out of date, but the larger takeaways and trends remain salient. With the engaging search tool, you can examine giving at the state, city, county, and even ZIP code levels. Click here to search through “How America Gives” by the Chronicle of Philanthropy! We live in the age of social media. Don’t underestimate the predictive value in exploring a prospect’s online presence and social connections. Social media sites are some of the most accessible prospect research tools around! You know the scene in a romantic comedy when the lead realizes that the love of her life was right in front of her the whole time? It was always her best friend. Google is the best friend in this situation. It never hurts to enter a donor’s name into Google. You never know how much information you’ll find from a simple search. For instance, you might discover that a donor works for a company that you know matches gifts, or maybe you’ll learn that a prospect is heavily involved in another similar nonprofit to yours. Google can be a great square one for research. Test out your prospect research prowess on Google now! If your prospect has a LinkedIn profile, it is an ideal place to get a sense of her business affiliations and professional life. Then, you can leverage that professional information during donor cultivation. Perhaps you have a relationship with one of your prospect’s colleagues who could introduce them to your organization. Or, you might learn that your prospect has served on the board of another nonprofit. And you could then let that knowledge inform your solicitation plans. Whatever details you uncover, you’re sure to find information that can help you foster a better relationship with your prospect. Click over to LinkedIn to explore your prospect’s professional connections! To learn more about a person’s interests, hobbies, and social relationships, Facebook is the perfect site to visit. As long as the donor has a public profile, you’ll really be able to learn a lot. You can also check Facebook and various other social media sites of nearby and/or similar nonprofits. Donors for those organizations are typically going to be prospects for yours. Explore what Facebook has to offer prospect researchers! Whether your organization prospect screens using an in-house team, a group of consultants, a prospect research company, or some combination thereof, it is a good idea to remain apprised of the prospect screening tools and resources available. Fundraising is a holistic process, and prospect screening is no exception. One database won’t tell you everything you need to know about a donor. Donors aren’t one-dimensional, and the research on them shouldn’t be either. Curious about a multi-dimensional approach to prospect screening? Try a demo of DonorSearch’s software today!